Why They Rock: Squats work just about every muscle in the lower body, including the glutes, hips, thighs, and calves. Not only that, it's a movement we do regularly throughout the day, so using it in your workouts will add some functionality to your training. How To: Stand with feet hip-width apart and toes facing straight ahead or angled slightly outward. Slowly bend the knees and squat, sending the hips back behind you while keeping your torso straight and abs pulled in tight. Keep your knees behind your toes. Make sure everything's pointing in the same direction. Squat as low as you can and push into your heels to stand up. Why They Rock: Push-ups, like squats, are compound movements using almost all the muscles of your body. You'll work your chest, shoulders, triceps, back, and abs all while increasing your upper body strength. How To: Get into a plank position—hands wider than shoulders and balancing on the toes or, for a modification, on the knees. Your body should be in a straight line from head to knees/heels. Slowly bend your arms and lower your body to the floor, keeping your neck straight and going all the way down until your nose touches the floor, if you can. And then push back up. Try to avoid locking the elbows at the top of the movements. Why They Rock: Like squats, lunges work most of the muscles in your legs, including your quads, hamstrings, glutes, and calves. How to Do It: Stand in a split-stance (one leg forward, one leg back). Bend your knees and lower your body into a lunge position, keeping the front knee and back knee at 90 degree angles. Keeping the weight in your heels, push back up (slowly!) to starting position. Never lock your knees at the top and don't let your knee bend past your toes. 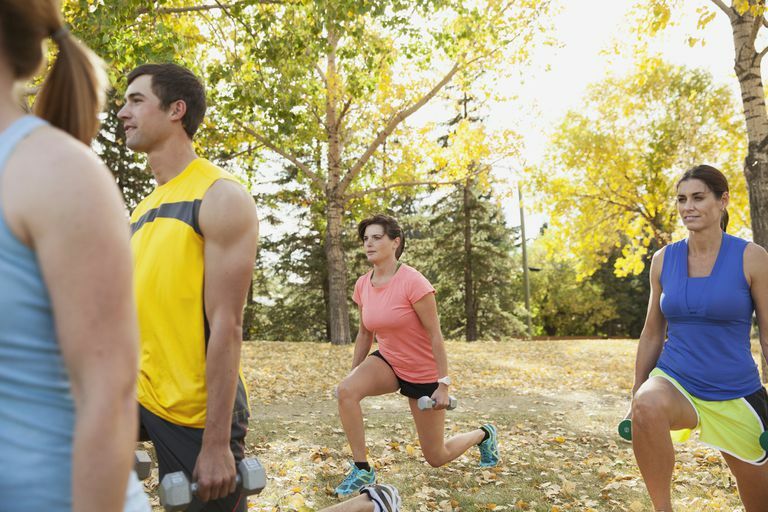 Variations include front lunges, back lunges, and side lunges. Do this exercise two to three times per week for 12 to 16 reps.
Why It Rocks: The plank (or hover) is an isolation move used in Pilates and Yoga and works the abs, back, arms, and legs. The plank also targets your internal abdominal muscles. How to Do It: Lie face down on the mat with your elbows resting on the floor next to your chest. Push your body off the floor in a pushup position with your body resting on your elbows or hands. Contract the abs and keep the body in a straight line from head to toes. Hold for 30 to 60 seconds and repeat as many times as you can. For beginners, do this move on your knees and gradually work your way up to balancing on your toes. Why It Rocks: The lat pulldown works on the major muscles of your back (the latissimus dorsi), which helps you burn calories and, of course, strengthen your back. How to Do It: Sit on the lat pulldown machine and hold the bar with your palms out and wider than your shoulders. Pull your abs in and lean back slightly. Bend your elbows and pull the bar down towards your chin, contracting the outer muscles of your back. Do this exercise two to three times a week using enough weight to complete 12 to 16 repetitions. If you don't have access to a gym, try a one-armed row. If you have a busy schedule, incorporating these five moves two or three times a week will help strengthen your muscles and bones, as well as burn more calories. Don't forget to do some cardio exercise as well!